On October 25, 2018, the Women Startup Challenge Europe showcased 10 of the best early-stage, women-led startups from across Europe. The pitch competition was cohosted by the Office of the Mayor of Paris and held at City Hall in Paris, France. The $35,000 grand prize went to Sampson Solutions, which capitalizes on business opportunities precipitated by the Paris climate agreement. Founded by Colleen Becker, Sampson is creating bio-based construction materials from sustainable sources using a closed-loop, carbon neutral manufacturing process. The $25,000 Mozilla Prize was awarded to Alex Haslehurst of Vitrue Health, the startup who best addressed data, privacy, and transparency. Vitrue Health is developing computer vision based tools that sit in the background of clinical assessments, autonomously measuring motor function metrics, freeing clinicians to focus on more complex patient interactions, and allowing them to detect and treat degradations in functional health. The OneRagtime Audience Choice Award went to Amel Bendali, COO and Cofounder of Inorevia, a startup that develops and commercializes a new generation of patented technologies that miniaturize lab instrument volumes for analysis. The 10 startups were chosen from more than 300 online applications. 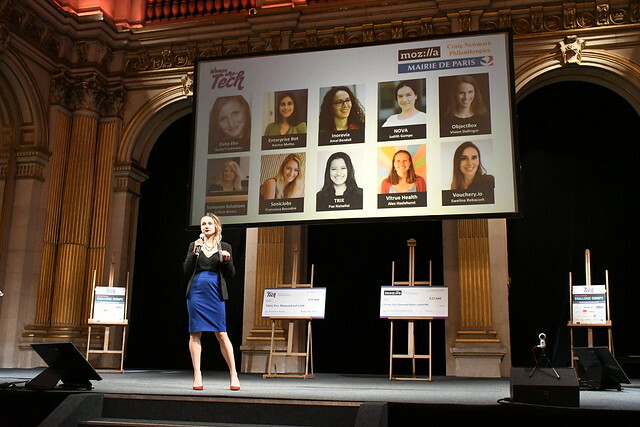 The event was cohosted by the Office of the Mayor of Paris, and the reception was catered by Epicery, a finalist in the 2017 Women Startup Challenge Europe. Meet all 10 of the finalists who were selected from hundreds of women-led startup applicants from 35 countries across Europe. Note: Women Who Tech uses an inclusive definition of “woman” and “female”, and we welcome transwomen, genderqueer women, and non-binary people who identify, have identified, or have been identified as female or woman.